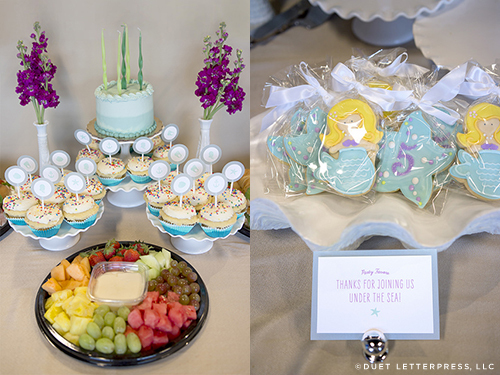 This year, Em wanted a mermaid party for her birthday! 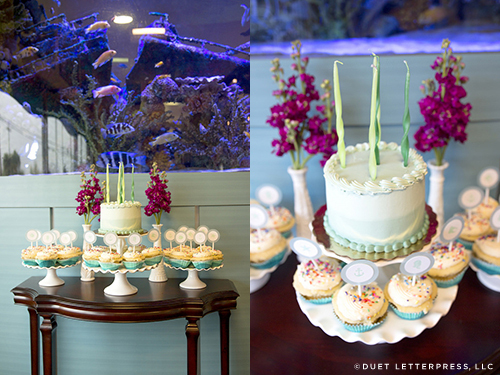 And a mermaid party during April was a fun challenge. Public pools open at the end of May. We found an indoor pool option but I wasn’t sure we were prepared to chaperone twenty plus five-year-olds. 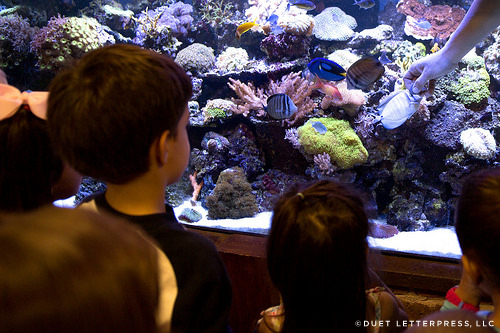 Then, we discovered The Fish Gallery – a tropical fish store that also installs professional tanks. They have a party room and a gorgeous showroom. It was perfect. 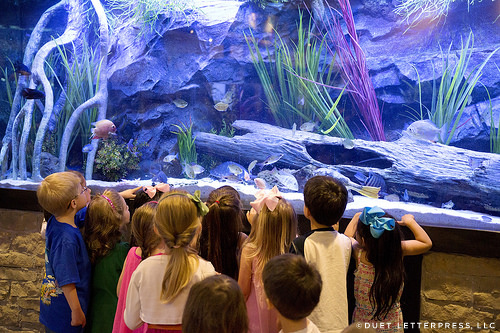 The kids got to watch + participate in feeding the fish in the grand showroom tanks. 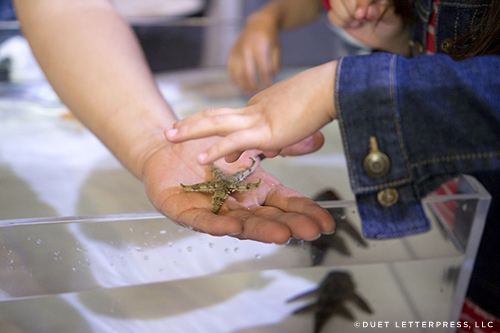 They toured the facility and got to touch starfish and little fish in the touch tanks. It was all wonderfully informative and the kids had such a fun time! Afterwards, it was hand washing time. Then, lunch and birthday cake! 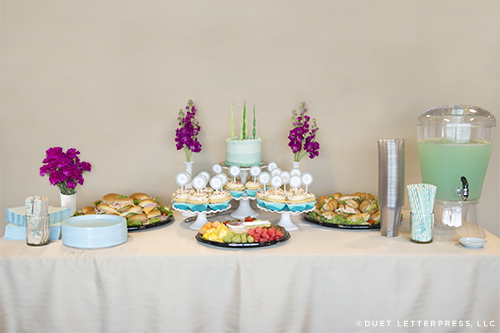 Like previous years, the sandwiches and fruit came from a local grocery store as did the flowers. 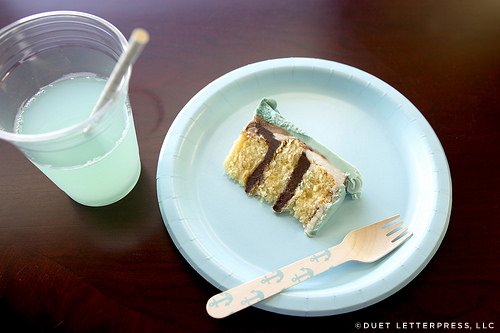 Continuing with the color scheme, we made a mint colored drink using lemonade and blue kool aid mix. We got a small, inexpensive custom birthday cake from Whole Foods. It had layers of chocolate ganache on the inside. Mummm! 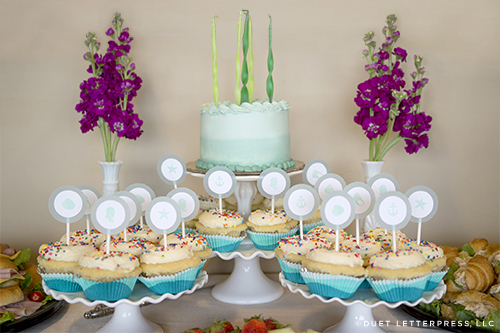 The cupcakes came from Hey Cupcake! and were part of The Fish Gallery’s party package. There were suppose to be all white. But, hey, kids love sprinkles! 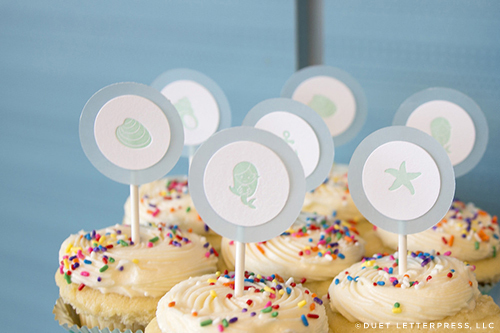 We letterpress printed mermaid + ocean characters and made cupcake toppers with them. 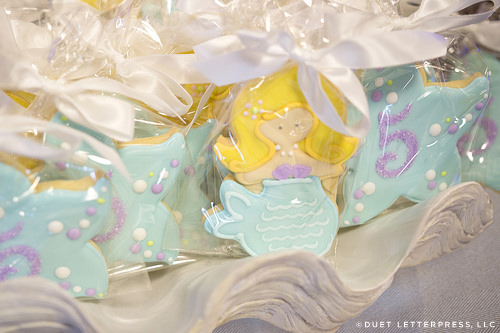 For party favors, we decided on these sweet mermaid and starfish cookies. They were incredibly good! I found starfish + seahorse glasses at Homegoods. 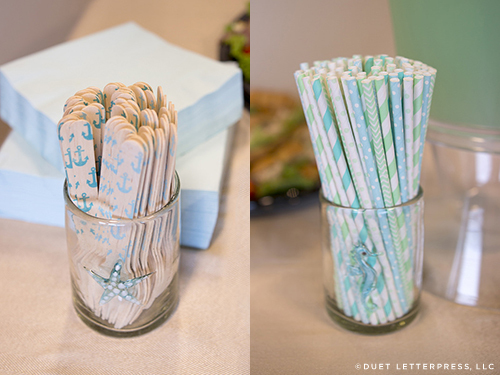 They were perfect to house the anchor forks and paper straws. So that’s it! Em’s mermaid birthday bash. Thanks to everyone that was able to join us and celebrate her fifth birthday! 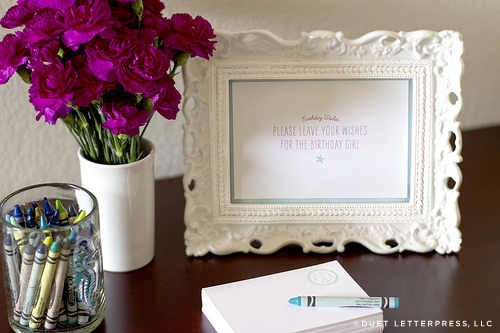 We look forward to sharing her birthday invitations with you, lovely readers. Be on the lookout! This entry was posted on Thursday, July 16th, 2015 at 3:57 pm	and is filed under parties. You can follow any responses to this entry through the RSS 2.0 feed. You can leave a response, or trackback from your own site.